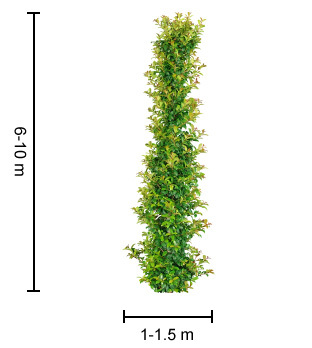 Description: Pinnacle™ Syzygium Lilly Pilly is a very narrow, compact and dense Lilly Pilly perfect for planting along fences or as a hedge or screening plant. Its leaves are rounded, bright glossy green with attractive contrasting reddish-brown new growth. Pinnacle™ Syzygium has lovely white duster flowers followed by red/pink fleshy fruit. Size: 6 – 10m high x 1 – 1.5m wide. Can be pruned down to 2m. 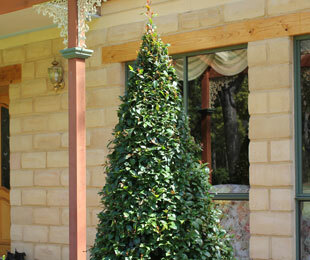 Uses: Ideal screen or hedge for tight planting areas (along fences and driveways) also for topiary. Position: Full sun to shade. Tolerates cold and drought. Pinnacle™ Syzygium suits moist, well drained soils. Care: Be aware of Psyllid. Water as required for 8-13 weeks until established. Plant in a well mulched garden (chunky mulch is recommended). If required use slow release fertiliser in spring. 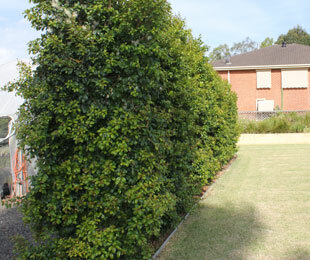 Prune yearly for a tidy hedge or every 2-3 years as a screen plant. For retail nurseries click here or buy from one of the online nurseries above. For wholesale growers please refer to the list below for growers in each state. For more detailed information on Pinnacle™ Syzygium click here.